Watches and warnings covering 17 counties. TORNADO WATCH 368 REMAINS VALID UNTIL 10 PM CDT THIS EVENING FOR THE FOLLOWING AREAS IN IOWA THIS WATCH INCLUDES 4 COUNTIES IN NORTHEAST IOWA ALLAMAKEE CHICKASAW HOWARD WINNESHIEK IN MINNESOTA THIS WATCH INCLUDES 3 COUNTIES IN SOUTHEAST MINNESOTA FILLMORE HOUSTON WINONA IN WISCONSIN THIS WATCH INCLUDES 7 COUNTIES IN CENTRAL WISCONSIN CLARK IN NORTH CENTRAL WISCONSIN TAYLOR IN SOUTHWEST WISCONSIN VERNON IN WEST CENTRAL WISCONSIN JACKSON LA CROSSE MONROE TREMPEALEAU THIS INCLUDES THE CITIES OF ARCADIA, BLACK RIVER FALLS, CALEDONIA, CRESCO, DECORAH, LA CROSSE, MEDFORD, NEILLSVILLE, NEW HAMPTON, PRESTON, SPARTA, TOMAH, VIROQUA, WAUKON, WHITEHALL, AND WINONA. ...THE FLASH FLOOD WARNING REMAINS IN EFFECT UNTIL 915 PM CDT FOR OLMSTED...MOWER...WABASHA AND DODGE COUNTIES... At 837 PM CDT, spotters, law enforcement, broadcast media and public have reported flooding mainly in urban areas across the warned area. Rainfall amounts of 2 to 4 inches have been reported. Turn around, don't drown when encountering flooded roads. Most flood deaths occur in vehicles. Excessive runoff from heavy rainfall will cause flooding of small creeks and streams, urban areas, highways, streets and underpasses as well as other drainage areas and low lying spots. In hilly terrain there are hundreds of low water crossings which are potentially dangerous in heavy rain. Do not attempt to cross flooded roads. Find an alternate route. .Recent rain and additional rainfall amounts of 1 to 5 inches area wide this evening into tonight will cause significant rises along the Cedar...Turkey and Root rivers. River forecasts take into account both observed and forecast precipitation. The Flood Warning continues for The Cedar River at Charles City. * from Wednesday evening to Friday afternoon...Or until the warning is cancelled. * At 4:30 PM Tuesday the stage was 3.2 feet. * Forecast...Rise above flood stage by Wednesday evening and continue to rise to near 14.6 feet Thursday morning. * Until 200 AM CDT Wednesday. * At 759 PM CDT, Doppler radar and automated rain gauges indicated that up to three inches of rain have already fallen, and an additional 1 to 2 inches are possible which could cause flooding. * Some locations that will experience flooding include... Owatonna, Albert Lea, Waseca, Wells, Blooming Prairie, Medford, New Richland, Clarks Grove, Ellendale, Alden, Glenville and Geneva. 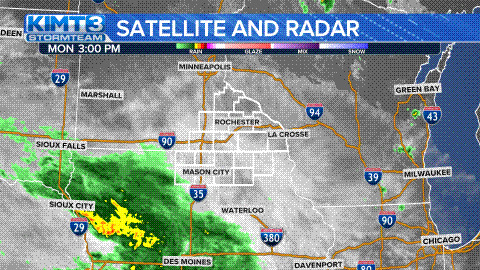 ...THE FLASH FLOOD WARNING REMAINS IN EFFECT UNTIL 1115 PM CDT FOR KOSSUTH...NORTHWESTERN HANCOCK AND WESTERN WINNEBAGO COUNTIES... At 800 PM CDT, Doppler radar and automated rain gauges indicated that heavy rain was falling over the area. Three to five inches of rain have fallen. Some locations that will experience flooding include... Algona, Union Slogh, Buffalo Center, West Bend, Bancroft, Burt, Whittemore, Thompson, Titonka, Wesley, Lakota, Woden, Rake, Lone Rock, Ledyard, Scarville, St. Joseph, St. Benedict, Irvington and Sexton. .Recent rain and additional rainfall amounts of 1 to 5 inches area wide this evening into tonight will cause significant rises along the Cedar...Turkey and Root rivers. River forecasts take into account both observed and forecast precipitation. The Flood Warning continues for The Turtle Creek Near Austin 3NW. * from Wednesday afternoon to late Thursday night...Or until the warning is cancelled. * At 4:30 PM Tuesday the stage was 2.4 feet. * Forecast...Rise above flood stage by Wednesday and continue to rise to near 10.9 feet Wednesday evening.